Abstract: Micro-LEDs have been presented as an emerging display technology offering both high-brightness and high-efficiency that is unmatched by any other display technology. Lumiode focuses work on combining micro-LED arrays with silicon thin-film transistors to form a fully monolithic, scalable semiconductor process. Our technology has the ability to reach over 1,000,000 cd/m2 in a microdisplay format and is particularly important for coupling with see-through optics in Augmented Reality applications. Bio: Vincent Lee is the Founder and CEO of Lumiode. Prior to forming Lumiode, Vincent earned his Ph.D. at Columbia University in Electrical Engineering, where he developed Lumiode’s core technology. At Columbia, he worked at GlobalFoundries advancing back-end-of-line interconnects for next generation microprocessors, and was a Senior Fellow in the Columbia Technology Ventures Fellows Program. 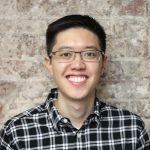 Vincent is a Fellow in the New York chapter of the Startup Leadership Program and is also involved as Chairman for the local chapter of the Society for Information Display helping to organize local speakers and events for the display community.